Maybe you remember an exercise in biology class about dominant and recessive genes in eye color, which allowed you to link your parents’ and grandparents’ eye colors to your own. Are other characteristics, such as nearsightedness or astigmatism, the result of genetics as well? in which the shape of the eye prevents light from being focused correctly on the retina. Refractive errors include nearsightedness, farsightedness and astigmatism. 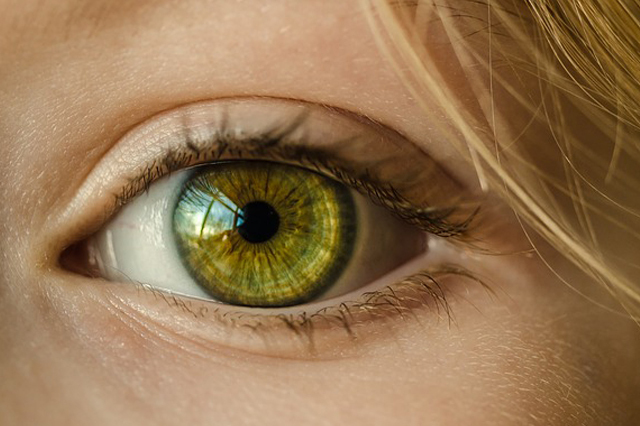 A research study in 2013 by Nature Genetics, in which scientists analyzed the data from 32 previous studies, discovered at least 24 new genes associated with refractive error, adding them to the two already known. Astigmatism: In a study of 500 sets of twins, British scientists at the Twin Research Unit at St. Thomas Hospital found that heredity is responsible for 50% of cases of astigmatism, in which the shape of the eye deviates from the ideal and cannot reflect light to the retina properly. Cataracts: Cataracts develop over time, due to aging, injury, diabetes or past surgery. Some are related to inherited genetic disorders that increase a person’s risk. Intense exposure to ultraviolet rays may increase their development. Download our Complete Guide to Cataracts for more information. Color blindness: Color blindness, which is the inability to tell the differences between certain colors, is primarily caused by a defective chromosome. This is more common in males than in females. Dry eye: Dry eye syndrome can be caused by environmental factors, both in the short- and long-term, as well as by aging, smoking, and Sjorgren’s syndrome. However, a 2014 study of nearly 4,000 sets of female twins by Nature Genetics found that genes had a 30% to 40% impact on whether an individual would be affected. Farsightedness (hyperopia): Farsightedness is one of the eye conditions in the category of refractive error. Researchers now have evidence that that it is among the conditions that are genetically determined. Glaucoma: If you have a family history of primary open-angle glaucoma, the most common kind, you are four to nine times more likely to get it than someone without that family history. There are forms of pediatric glaucoma, however, that are not inherited but instead caused by injury, surgery or another condition. Macular degeneration: As the leading cause of vision loss, happens when the central part of the retina begins to deteriorate. It appears to be inherited in a large percentage of cases, and researchers are beginning to identify the genes involved. Nearsightedness (myopia): Recent research says that if neither of your parents is nearsighted, you have only about a 2.5% chance of being nearsighted. If one of your parents is, your chances increase to about 20%; if both of your parents are, your chances jump to about 33%, or 1 in 3. Retinitis Pigmentosa: A group of related, inherited disorders that can cause night blindness and gradual loss of vision. Some eye conditions are affected by what happens in your life, such as the environmental elements to which you are exposed, whether you smoke, or whether you are overweight. Dry eye syndrome, for example, can be exacerbated by living in the desert. The Centers for Disease Control and Prevention say that smokers are twice as likely to develop macular degeneration and two to three times more likely to develop cataracts than a nonsmoker. Although color blindness affects more males than females, the reverse is true for eye conditions like cataracts and macular degeneration. The American Foundation for the Blind’s Women’s Eye Health Task Force says that nearly two-thirds of all visually impaired or blind people are women. One reason is that many eye diseases are age-related, and women tend to live longer than men. Other conditions, such as dry eye syndrome, are affected by hormones. And women tend to have more autoimmune disorders than men, which often affect vision. Stargardt’s Disease: Comprises the central vision of the eye and can cause blind spots, decreased sharpness and decreased color vision. If you have questions about your quality of vision, Barnet Dulaney Perkins Eye Center is ready to provide you with top quality vision care no matter where you are in the state of Arizona. Contact us today to schedule your vision exam.